Exit #62. 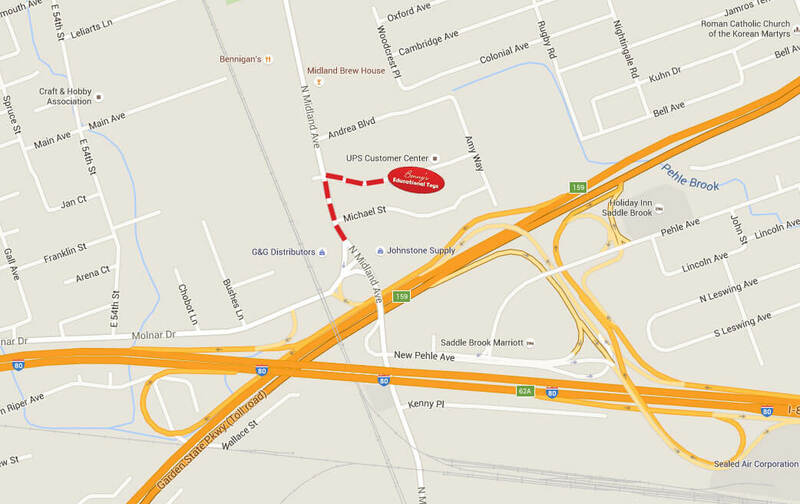 Follow signs to Midland Ave (Right turn onto Phele Ave , Right Turn onto New Phele Ave), Right turn onto Midland Ave. Enter Right onto David Rd in the Zuckerberg Industrial Park (It's the main entrance - you'll see a big yellow smiley face sign next to the entrance). We are in the 5th building (Bldg. L-1) on the right side (just across from the UPS customer center). Exit #62. Follow signs to Saddle Brook/Midland Ave (Right turn onto Phele Ave , Right Turn onto New Phele Ave), Right turn onto Midland Ave. Enter Right onto David Rd in the Zuckerberg Industrial Park (It's the main entrance - you'll see a big yellow smiley face sign next to the entrance). We are in the 5th building (Bldg. L-1) on the right side (just across from the UPS customer center). Exit #159, Follow Signs to Midland Ave. At Light make a Left turn onto Midland Ave (Fair Lawn direction) and then immediately turn Right onto David Rd in the Zuckerberg Industrial Park (It's the main entrance - you'll see a big yellow smiley face sign next to the entrance). We are in the 5th building (Bldg. L-1) on the right side (just across from the UPS customer center). Exit #159, Follow Signs to Saddle Brook/Midland Ave. At second Light make a Right turn onto Midland Ave and immediately turn Right onto David Rd in the Zuckerberg Industrial Park (It's the main entrance - you'll see a big yellow smiley face sign next to the entrance). We are in the 5th building (Bldg. L-1) on the right side (just across from the UPS customer center).